Patrick Lencioni (San Francisco, CA) is founder and president of The Table Group, a management consulting firm specializing in executive team development and organizational health. As a consultant and keynote speaker, he has worked with thousands of senior executives in organizations ranging from Fortune 500s and high-tech start-ups to universities and nonprofits, including Southwest Airlines, Sam’s Club, Microsoft, New York Life, Cox Communications, Washington Mutual, Visa, FedEx, and the US Military Academy at West Point. 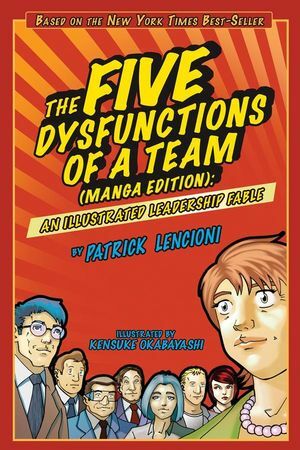 He is the author of seven books which have sold nearly two million copies total, including the New York Times best-seller The Five Dysfunctions of a Team, The Three Signs of a Miserable Job, Silos, Politics and Turf Wars, and Death by Meeting. Kensuke Okabayashi (Jersey City, NJ), author of Manga for Dummies, was a graduate of the School of Visual Arts; his works are being represented by various illustration agencies in New York City. His current illustration projects include Magic the Gathering (Wizards of the Coast,) Takara U.S.A., Kensington Books, Carl Fisher Music Books, and Skyzone Mobile Entertainment. His storyboards for top clients include Diesel Clothing, Diet Coke, Diet Pepsi, Canon Digital, Absolute Vodka, and All Nippon Airlines. Awards and shows include The Harvey Kurtzman Award, Mercer Artist's Juror Choice Award, and The Society of Illustrators Award (New York City.) In addition to his creator owned series "JAVA!" published by Committed Comics, Kensuke is illustrating a number of graphic novel series with Image Comics writer, Mark Rickets, titled "Rocket Jockeys" and with Arcana Comics writer, Sal Cipriano, titled "Tiki Road." He has instructed illustration courses at Mercer College (NJ) and instructs art classes at the Educational Alliance Art School in NYC. Part Two: Lighting the Fire. An Overview of the Model. A Note About Time: Kathryn's Methods.